Muse is an English rock band from Teignmouth, Devon, formed in 1994. 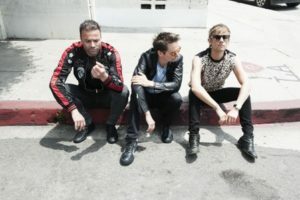 The band consists of Matt Bellamy (lead vocals, guitar, keyboards), Chris Wolstenholme (bass guitar, backing vocals), and Dominic Howard (drums). Simulation Theory is the eighth studio album by English rock band Muse. It was released on 9 November 2018 through Warner Bros. Records and Helium-3. Muse coproduced the album with Rich Costey, Mike Elizondo, Shellback, and Timbaland. Following the darker themes of Muse's prior albums, Simulation Theory incorporates lighter influences from science fiction and 1980s pop culture, with extensive use of synthesisers. The contemporary political climate of the United States informed the lyrics.